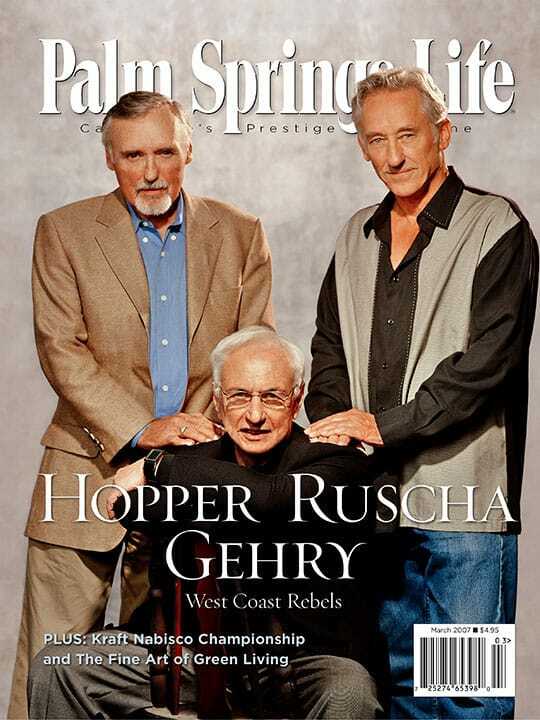 ON THE COVER – Dennis Hopper, Frank Gehry (seated), and Ed Ruscha at Ruscha’s studio. Photography by Michael Childers. By Steven Biller. Photography by Michael Childers. Shock and awe mark the better part of 50 years of now-iconic work by Dennis Hopper, Frank Gehry, and Ed Ruscha — honorees at Palm Springs Art Museum’s second annual Artists and Legends Gala. Photography by Michael Childers. Wardrobe styling by Susan Stein. Fashion, fantasy, and fine art create an aura of mystique on the eve of Fashion Week El Paseo. By Ann Japenga. Photography by Kyle Martin/Sherrill & Associates. Working quietly and almost invisibly, the Desert Mountain Land Trust is acquiring and protecting land for wildlife; Ted Lennon straddles the line between development and open space. Classical piano performances inspire young people to greatness. By Janice Kleinschmidt and Joan Page McKenna. JazzTrax meets the Indian Wells Arts Festival; Cactusberry owners take Al Gore’s warnings about global warming to heart; Narendra Patel’s “sustainable, humanistic architecture”; Wear your art on your sleeve. Plus: Intelligencer. By Patrick Deveraux. Photography by Andrew Yeadon. Lamborghini’s open-air Gallardo Spyder offers a new realm of luxury. By Jude Camillone and Steven Biller. John Divola points his lens toward the odd and isolated; Ted Gall serves up his worldview in small sculptures; Mazal and Marin fiesta in Palm Desert. By Janice Kleinschmidt. Photography by Mark Davidson. Celebrities lend their names, faces, and time to wine. Apply corporate management principles to your personal finances. Eccentric Cabot Yerxa wooed a teacher of metaphysics and symbolism. Warmer days enter the equation. Edited by Lisa Marie Rovito. A guide to new residential development in the Coachella Valley. The official guidebook of the Palm Springs Desert Resorts Convention and Visitors Authority. Everything you need to know about what’s happening in the desert.